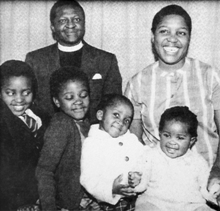 7 October, Desmond Mpilo Tutu is born in Klerksdorp, in the then Transvaal province of South Africa. Desmond Tutu is ordained as a minister in the Anglican Church. Quote: "History, like beauty, depends largely on the beholder, so when you read that, for example, David Livingstone discovered the Victoria Falls, you might be forgiven for thinking that there was nobody around the Falls until Livingstone arrived on the scene." From Desmond Tutu's speech "Fortieth Anniversary of the Republic?" 16 October, Desmond Tutu is awarded the Nobel Peace Prize in recognition of his endeavours for a non-violent end to apartheid. 3 January, "For goodness sake, will they hear, will white people hear what we are trying to say? Please, all we are asking you to do is recognise that we are humans too." 9 January, "I am not interested in picking up crumbs of compassion thrown from the table of someone who considers himself my master. I want the full menu of human rights"
Desmond Tutu is ordained the first black South African Anglican Archbishop of Cape Town. "Your president is the pits as far as blacks are concerned. I think the West, for my part, can go to hell." - Desmond Tutu, after Ronald Reagan on July 22, 1986, called proposed sanctions against South Africa a "historic act of folly." Desmond Tutu is appointed chairman of South Africa's Truth and Reconciliation commission. Desmond Tutu retires as Archbishop of Cape Town. 8 June, "There are different kinds of justice. Retributive justice is largely Western. The African underTutustanding is far more restorative - not so much to punish as to redress or restore a balance that has been knocked askew." from "Recovering from Apartheid", in The New Yorker. 1998, 1 January: Desmond Tutu establishes the Desmond Tutu Peace Trust. "Ubuntu is very difficult to render into a Western language... It is to say, 'My humanity is caught up, is inextricably bound up, in what is yours.'" Desmond Tutu, in his book No Future Without Forgiveness. 12 June, "I wanted to become a doctor, a physician, and I was admitted to medical school, but my family did not have the money for fees. So I ended up becoming a teacher. I stopped being a teacher when the South African Government introduced a deliberately inferior education for blacks called Bantu education, and I felt I wasn't ready to collaborate with this apology for an educational system. Our children, the 1976 kids who revolted against apartheid in Soweto, called it "gutter education," and it was gutter education. I left teaching. Of course, I didn't have too many option, and mercifully, the Bishop of Johannesburg at that time accepted me for training for the priesthood. So I came to the priesthood, as it were, by default." "I often accompanied my father. I really liked riding with him on his bicycle on Saturdays. He was very fond of fishing. I don't think I liked fishing. I mean, you had to sit quietly and still, but I enjoyed the ride. And it was fun, it was fun. I mean, as I say, you didn't go around lugging a deep sense of resentment. We knew, yes, we were deprived. It wasn't the same thing for white kids, but it was as full a life as you could make it. I mean, we made toys for ourselves with wires, making cars, and you really were exploding with joy!" October, "I am always intrigued because if you will notice, Zapiro always draws my nose peeping into my mouth. A very big thank you to the Trust and University. I am deeply touched and lack words to express my appreciation" - Desmond Tutu on receiving a Zapiro cartoon as a present for his 75th birthday. What's the best thing about life at 75? Tutu: "Looking back and now saying, 'Hey, we are free!' And realizing it is possible for good to overcome evil and to know that we can do it together." In 1998, you told the Archbishop of Canterbury that you were ashamed to be Anglican when the church failed to liberalize its attitudes toward gay clergy. Do you still feel that way? Tutu: "Yes. For me, there doesn't seem to be a difference at all with how I felt when people were being clobbered for something about which they could do nothing -- their race. I can't believe that the Jesus Christ I worship would be on the side of those who persecute an already persecuted minority. That we should be tearing ourselves apart on this issue of human sexuality when the world faces such devastating problems as poverty, AIDS and conflict seems as if we are fiddling whilst our Rome is burning." How close is South Africa to realizing your dream of uniting as a "rainbow people of God"? Tutu: "Reconciliation is a long process. We don't have the kind of race clashes that we thought would happen. What we have is xenophobia, and it's very distressing. But maybe you ought to be lenient with us. We've been free for just 12 years." You and Nelson Mandela have quibbled over fashion in the past. For the record, who's the better dresser? Tutu: "Modesty prevents me from saying what I really think. But... his sartorial taste is the pits! [Laughs] He's such a lovely guy, but he was nasty to me when I publicly commented on it. He said the critique was pretty amusing coming from a man who wears a dress! " Quote: "It was fairly straightforward that one of the things we had to do was to seek to establish a moral position. The second was maintaining the morale of our people. Telling our people 'your cause is a just cause.' This is, in fact, a moral universe. We're going to win." Quote: "People who call pacifists weak, that's not the case. Actually you go into confrontation. You confront violent people without weapons and your confrontation draws out their violence as it did in Birmingham with the dogs as it did in South Africa with the dogs. And that worked beautifully in Capetown in those few months. It was called the Defiance Campaign. The police violence, which was normally confined to black townships, was exported into the city. There was a particular evening, in which the Anglican Cathedral went to a judge to seek an order to stop the police from beating people up indiscriminately on the streets. Well, the police lawyer had considerable difficulty persuading the judge not to grant the order when the judges own clerk had been beaten up on the way to court to hear the case that evening." November, Quote: "The reprisal against the suicide bomber does not bring peace. There is a suicide bomber, a reprisal and then a counter-reprisal. And it just goes on and on." 28 November, On whether PW Botha is now in heaven or in hell: "God is the only one who decides. I hope his soul rests in peace." On whether PW Botha had received adequate recognition for his role as a reformer: "I think we shouldn't be dismissive of anybody. I always reckon that each one of us has the capacity to become a saint, anyone and everyone. I'm willing to acknowledge whatever initiatives he may have taken. But I think that he will be remembered mostly for his ... he was granite-like, you know. And the finger-wagging. Those are the things people are going to remember him for." 16 March, "We Africans should hang our heads in shame. How can what is happening in Zimbabwe elicit hardly a word of concern let alone condemnation from us leaders of Africa? After the horrible things done to hapless people in Harare, has come the recent crackdown on members of the opposition ... what more has to happen before we who are leaders, religious and political, of our mother Africa are moved to cry out 'Enough is enough?" July 2007: Featured in Vanity Fair's Africa Issue profiled by Brad Pritt. April 2009: Received Spiritual Leadership award from Humanity’s Team at Freedom Park in Pretoria, South Africa. 8 May 2009 speaker at MSU’s spring undergraduate convocation. 12 August 2009 Received the presidential medal of freedom from Barack Obama. 2010, 22 July: Archbishop Tutu announces his decision to retire from public life. 2011, October: Desmond Tutu lashes out at the South African Government after the Dalai Lama is denied a visa to attend his birthday party, saying he would ‘pray for the downfall of the ANC’. 2012, September. Desmond Tutu says 'Tony Blair and George Bush should be hauled before the international criminal court in The Hague and delivered a damning critique of the physical and moral devastation caused by the Iraq war'. 2012, September. Desmond Tutu expresses his outrage at 'failing politicians in South Africa'. 2012: Desmond Tutu is awarded $1 million dollars by the Mo Ibrahim Foundation for 'his lifelong commitment to speaking the truth to power'. 2013, April: Desmond Tutu wins the Templeton prize for advancing 'spiritual progress'. 2014 In an interview with Ann Curry, Tutu referred to the oppression of gays as the ‘New Apartheid’. 2014, April 27. Freedom Day: Desmond Tutu says he is glad that Nelson Mandela is dead so that he does not have to see what the country leaders are doing to the country. 2014 July, 12. Desmond Tutu pleads for assisted dying before the Historic Lords debate, saying that 'the manner of Nelson Mandela's prolonged death was an affront'. 16 July 2014, Mpho Tutu gives a media update on her father’s health after he was admitted to hospital for a ‘persistent infection’. 2014, 10 December. Desmond Tutu marks 30 years since winning the Nobel prize, but cancelled plans to attend the Nobel Peace Laureates Summit in Rome due to health reasons. 2015, 2 August 2015: Desmond Tutu reported as responding well to ‘minor investigative surgery’. 2015, 7 August: Desmond Tutu launches a petition calling on British prime minister David Cameron and the Secretary-General of the United Nations, Ban Ki-Moon to respond urgently to climate change by setting a renewable energy target of 100% by 2050. 2015, 27 August, The Desmond and Leah Tutu Foundation gives a media update after Archbishop Emeritus Tutu was re-admitted to hospital for ‘a fresh course of antibiotics’. 2015, 7 October: Archbishop Emeritus Tutu celebrates his 84th birthday at home while recovering after several hospital visits. 2016, April 22: Archbishop Emeritus Desmond Tutu and his wife Leah received the Award for Peace with Justice for their contribution to social justice. 2016, June 8: Archbishop Emeritus Desmond Tutu nominates Marwan Barghouthi, a Palestinian political activist for the 2017 Nobel Peace Prize. 2016, 10 July: A church service held at St Mary’s Cathedral in Braamfontein to commemorate Archbishop Emeritus Desmond Tutu’s 40 years in Episcopal service is attended by hundreds of people. 2016, July: Archbishop Emeritus Desmond Tutu pens a letter to a newborn baby girl after her father wrote to him saying that he was wanting to compile a collection of letters to his newborn daughter, Juliet. In the letter in which Tutu refers to Juliet as 'little sister', he writes candidly that as she is starting her life, he is reaching the end of his. He ends the letter saying 'you and I and everyone else were born with the same purpose: for love, for goodness and for one another'. 2016, 25 August: Archbishop Emeritus Tutu hospitalised for 'a recurring infection'. 2016, 5 September: A Palestinian film director named Emad Burnat, sends a touching letter to Archbishop Emeritus Desmond Tutu, praying for his recovery, and thanking him for supporting the Free Palestine movement. 2016, 7 September: Archbishop Emeritus Desmond Tutu, undergoes surgery on the 30th anniversary of his being ordained Archbishop of the Anglican Church of South Africa. 2016: 21 September, Archbishop Emeritus Desmond Tutu, discharged from hospital after his re-admission a few days following surgery.